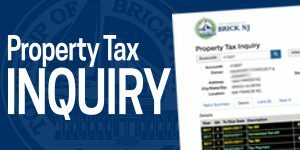 The Tax Collector is responsible for the collection of taxes levied on all properties in Brick Township. These include municipal government taxes, public school taxes, county government taxes, library, open space and fire district taxes. The Tax Collector for Brick Township is Jo Anne Lambusta, CTC. Ms. Lambusta has been an employee of Brick Township since 1984 and has served as the Tax Collector since 1989. She currently serves as the President of the New Jersey Tax Collectors and Treasurers Association of New Jersey. The Tax Collector’s Office is open Monday through Friday, 9am-4pm. You can reach the Tax Collector’s Office by phone at 732-262-1021. Property taxes are billed in Brick based on a calendar year, January 1st to December 31st. First Quarter due February 1st covers billing for the months of January, February & March. Second Quarter due May 1st covers billing for the months of April, May, & June. Third Quarter due August 1st covers billing for the months of July, August, & September. Fourth Quarter due November 1st covers billing for the months of October, November, & December. There is a 10 day grace period, on the 11th day interest is calculated back to the 1st. If the 10th falls on a weekend or legal holiday, you have until the next working day to make payment. We cannot accept postmarks. Do not mail credit card information to us. We cannot accept credit card payments for Tax Sale Items or to Redeem Tax Liens. Property owners may fill out a short form and provide a voided check at the tax office which will allow the Township to make a direct withdrawal (at no additional cost to the property owner or the township) from the taxpayer’s checking account or savings account. ACH payment may be cancelled by the property owner in writing at any time prior to the quarterly tax due date. ACH payments will come out of your account during the ten day grace period. Click here to download ACH form. All appeal questions should be directed to the Ocean County Board of Taxation 732-929-2008. After construction is deemed complete, an assessment will be placed on the property for this improvement. The new assessment will cause additional bill(s) to be issued. A bill called an Added Assessment Bill will be sent out in October and will be due November 1st (4th qtr) of the current year, February 1st and May 1st of the following year. The added bill must be combined together with your original tax bill that was received in June/July. When the new bills are generated the following June, all taxes will be combined into one bill unless additional construction took place. What if I have a lien on my property and want to pay it off? We need a written request (72 hours prior) requesting a redemption figure, with a date that the Tax Office will receive the payment, along with the block/lot/lien number. This payment for redemption must be certified funds, cash, or money order.